I Got A Special Delivery! 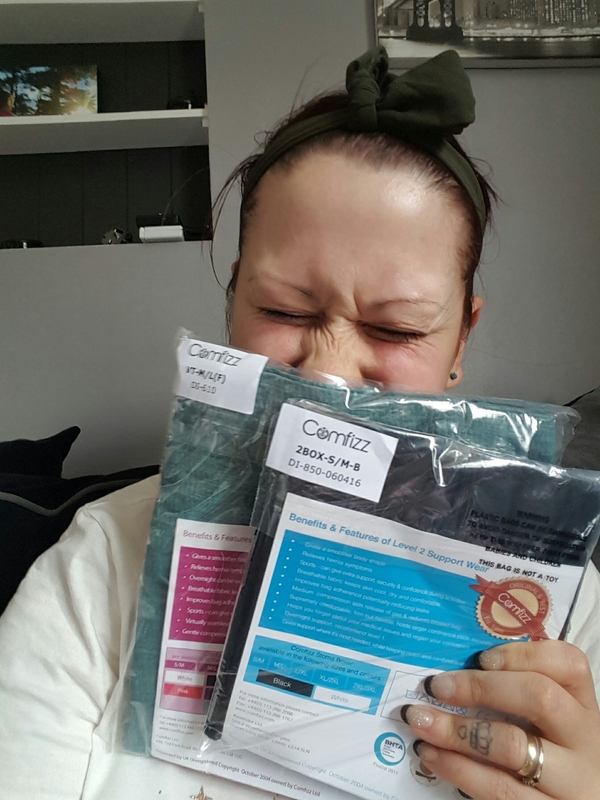 I was lucky enough to get a package through the post from the lovely Megan over at Comfizz. We had been chatting about the fact I want to go running again and their level 2 boxers which offer more support against hernias, I’m terrified of getting one if I’m honest. 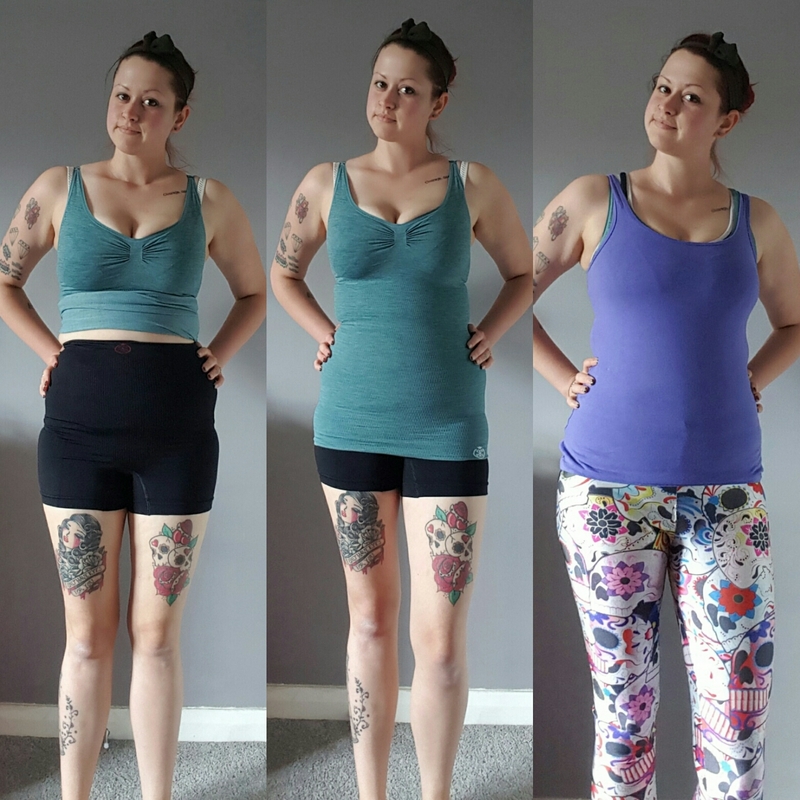 I also wanted to have a look at their vests too because I like to layer up whilst exercising and I didn’t think there was much harm putting the two together. For starters how neat is Megan’s handwriting? 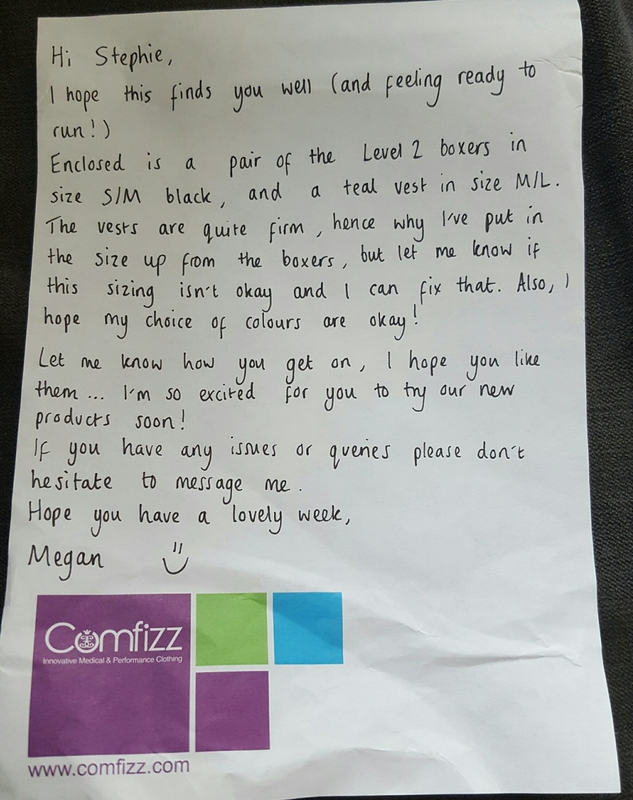 You can tell she cares about the products they provide because of the technical detail in the note about the vests being firm. Secondly I love green so teal is going to be absolutely great! Colour of geniuses my grandad used to say and I believe that! The boxers are high enough to cover my bag and the legs come down just far enough that they won’t wedgie me (haha) like some underwear can. The vest is nice and long I personally like that as I worry they ride up and show my belly. Now I don’t care about showing my bag but the “mum pooch” I do! 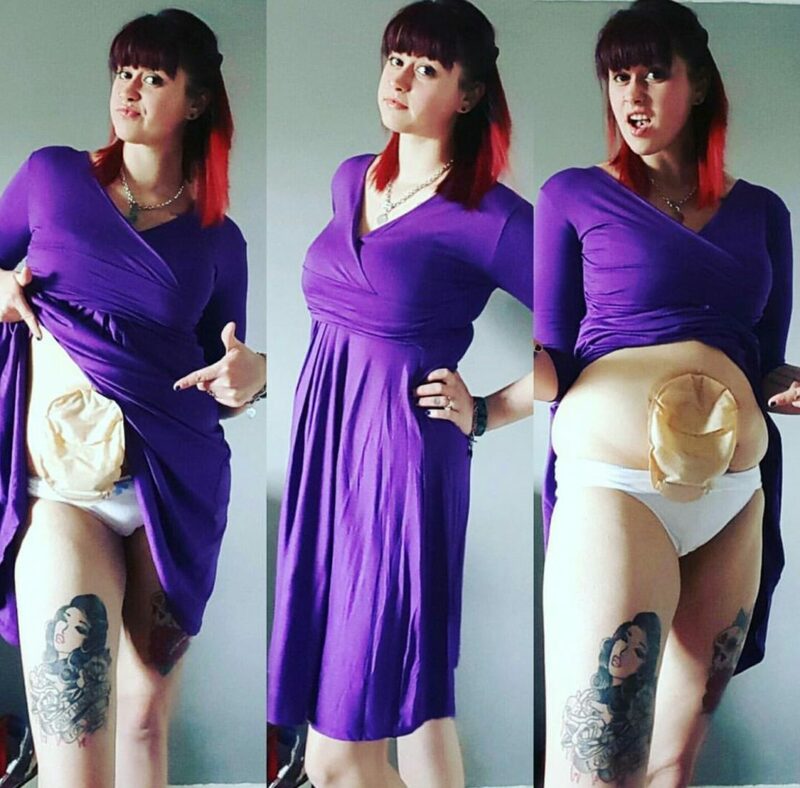 In the last picture you can’t tell I have support wear on or an ileostomy! I also found my sports bra which is also useful! Please excuse the shoddy side photos! I always look like I’m on a wonk! My bag here isn’t full but I forgot to empty it before the photos, however you can’t tell it’s a bag I just look bloated. So that’s a win for sure! I definitely think they are both very versatile products. I feel like I will be able to exercise safe in the knowledge that I have a decent amount of support on my abdomen, with the boxers and can be worn on a daily basis Or whilst I’m at work (however I would obviously get level one for the daily wear as my life isn’t strenuous) The vest will nicely smooth out the shape of my bag, lumps and bumps I have under any piece of clothing. I can also say the vest is perfect if you aren’t wearing a bra but not doing anything to much round the house. 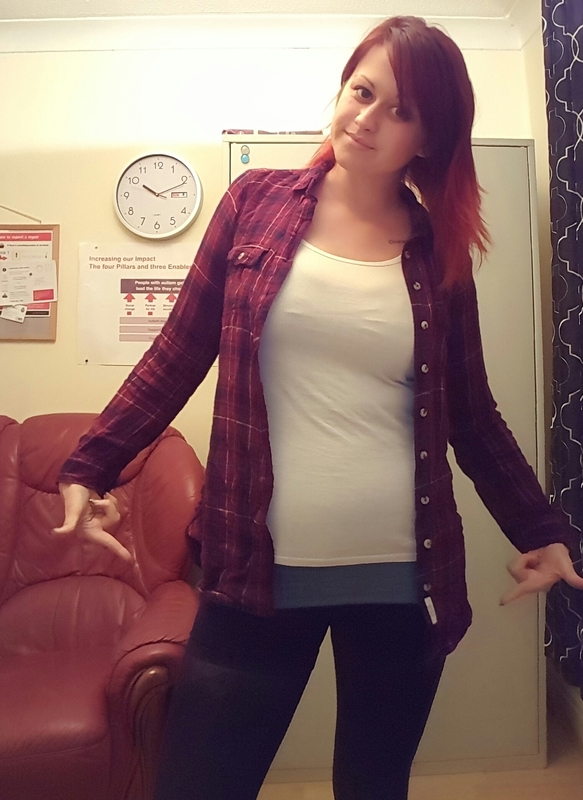 I was particularly impressed with that because those little tops with a bra “built” in are pants for larger busted ladies but these are fine, kept them in place without the fake bra. The running side of things hasn’t gone my way yet with husband and child wanting to come and I felt bad running off. Then the typical British weather happened and then back at work (I do nights) BUT IT WILL!!! The only small issue I had if I was being over critical and isn’t really anything to do with the products overall is the fact I’m quite “hippy” as one of my best friends put it when she tattooed me the other day. 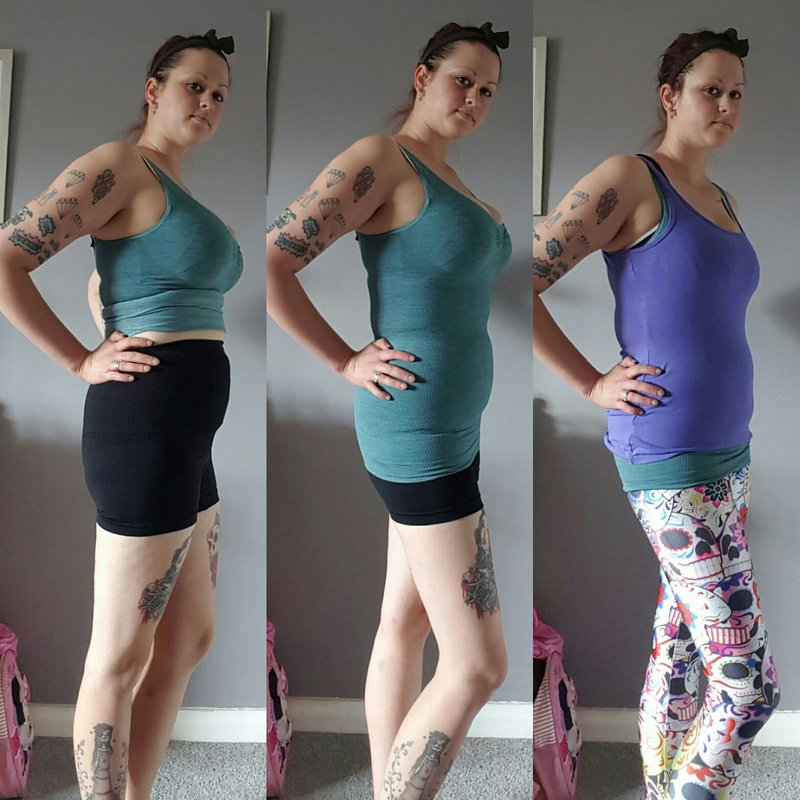 But not just hippy my stomach bloats big time and the boxers don’t seem to like that they roll down ever so slightly (I’m going to lose a couple of pounds/tone up so in time that shouldn’t be an issue) but I have a feeling that any firm support wear will do the same on my body shape. Regardless of my body being ridiculous I love them, I feel comfortable and secure. Let’s face it that’s what I want! On the plus side I can wear them over tights at work and they look like shorts! So I’m still adhering to my works dress code ish! Although I’m in black thick tights so you may not be able to see that well.